Prepare yourself to go on a journey full of amazing experiences and challenges! 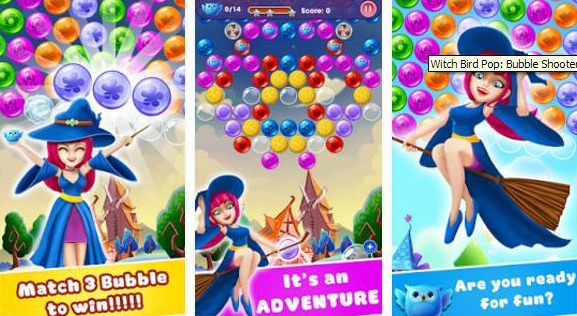 Today we take you to the world of Witch Bird Pop: Bubble Shooter, a casual, yet adventurous gaming app launched recently on the Android platform. It is developed by Free bubble shooter Game studio, who made it compatible with all Android devices and designed it with alluring graphics and engaging sounds and sound effects. If you’re looking for a true challenge and entertainment, then the Witch Bird Pop: Bubble Shooter game is the perfect match for you. Your goal is to pass all the obstacles on your way in order to save the cute birds that are trapped in colored balls by the evil monsters. Match and shoot at least three same colored balls, make them explode and make even more damage to save the birds. Shoot different balls for different damages and play through 300 levels, each one of them more challenging than the others. You will also have the chance to collect golden coins to buy more great items to help you out. Don’t wait any longer, join the adventurous journey, and make your time spend on your mobile more fun by downloading Witch Bird Pop: Bubble Shooter for free from Google Play.